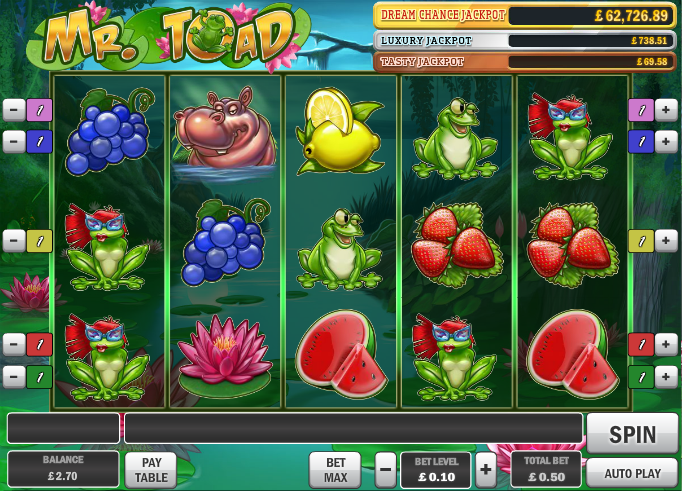 We are heading down to the waterside as guests of Mr. and Mrs Toad to play this online slot from Play N Go. It’s one of a series of releases from this company connected to it’s progressive jackpot network. It also features several individual bonus features so it’s really got something for everyone. Mr. Toad is a five reel game with only five paylines and it takes place in a lily pond – the natural home of our amphibian hosts. There’s some nicely drawn fruit – strawberries, lemons, grapes and melons – as the lower value symbols and some wildlife as the higher values, including a butterfly, a hippopotamus, and Mr. and Mrs Toad. The pink lily is the bonus symbol which will activate the main feature and unusually there is no wild in this game. We do like the fact that you can win with matching symbols from right to left as well as left to right. Landing Mr. and Mrs Toad next to other on the reels will also pay out. Trigger this mini-game by landing three or more of the lily bonus symbols on consecutive rows. The more lilies you can land, the higher the prizes will be in the following game. You will be shown a pond with a number of lily pads and your task is to make it to Mrs Toad on the other side. You can only move to the next pad to your current position and from the third move, there’s a chance the hippo will eat you – that’s game over. The further you make it, the bigger the prize you will win. In the base game, if you can land a butterfly directly to the right of Mr. Toad or to the left of Mrs Toad, their tongue will shoot out and grab it, winning you up to 10x your total bet. Three gold rings – spin the bronze wheel of fortune to win a cash prize, the Tasty Jackpot or a move to the silver wheel. Four gold rings – spin the silver wheel for a cash prize, the Tasty and Luxury Jackpot’s or a move to the gold wheel. Five gold rings – spin the gold wheel for a cash prize or the chance to win the Tasty, Luxury and Dream Chance Jackpots. You can opt to try and double or quadruple your most recent win by clicking on the appropriate buttons below the reels; ten correct picks are the limit. Watch out for that gamble feature – it’s tempting to try and increase your winnings each time but don’t fall for it. Have an occasional flutter if you must. This is fairly similar to other Play N Go slots such as Gem Drop but it’s still nicely produced and comes with it’s own individual feature. Definitely worth checking out, especially for progressive jackpot fans.